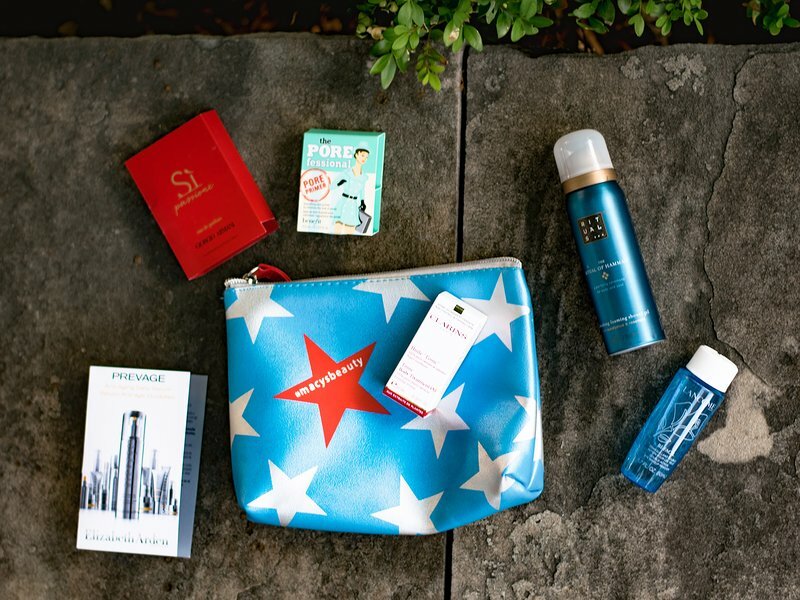 Macy's Beauty Box — Denv.Her. Hello beautiful babes! Time to refresh your beauty product stash and remind you all about the Macy’s Beauty Box subscription! We gave you a run down on the beauty subscription last year and it's time for an update! This subscription is only $15 a month for 5 deluxe samples, + a bonus sample every month. Your samples will come in a cutie storage pouch and you will get a coupon for $5 off your next Macy's beauty purchase (because you are obviously going to want to buy more of what you try from the box once your sample runs out!). The Macy’s Beauty Box features brands such as Tarte, Urban Decay, Origins, Peter Thomas Roth, Benefit, Lancôme, and so many more! Check out our run down of July’s products below! Each of these products was used the night prior and day of this shoot! Want your pores to disappear? #YAS. Let us introduce you to The Pore Professional from Benefit. We have used this product before and loved it so we were super excited to see this in the July box. From the creamy texture to the smoothing qualities, this primer will make your skin look pore-less and can minimize the look of pesky wrinkle lines as well. This product comes with serious result claims so we were thrilled to be able to try this bad boy out. As the name details, this product is an anti-aging serum that helps treat proof of aging. Elizabeth Arden took the time to implement at study to prove the effects of this formula so it's pretty legit right off the bat - but we wanted to see how it did with our skin. This sounds bizarre but both my sister and I noticed a subtle difference in our skin in about 15 minutes after application. The treated skin started to have a noticeable glow and in the morning, more firmness in the treated areas was present. Both my sister and I purchased the 1 oz serum size of Prevage from Macy's after this! Are you like us & despise taking off your eye makeup at night? Well Lancôme makes the process SO much easier with their Lancôme’s Bi-Facil Double Action Eye Makeup Remover. This product makes taking off your mascara and eyeliner a breeze which saves your eyes and eyelashes from excessive scrubbing and pulling. We use this stuff religiously. Created exclusively for Macy’s - a must try! This perfume is deliciously playful with fragrance notes of sparkling pear, rose, and woody vanilla. It is perfect for a summer evening. The purpose of this oil is to improve skin elasticity and we have been pleased with the results of this oil so far. We were so excited to try this oil and have been pleased with the results so far. This oil is 100% natural and has no preservatives - it leaves your skin feeling hydrated and extra smooth after use. Make sure to sign up for your Macy's Beauty Box subscription today! Let us know what you find in your fall boxes <3 !